The final layer on the wedding cake and by far the most delicious. 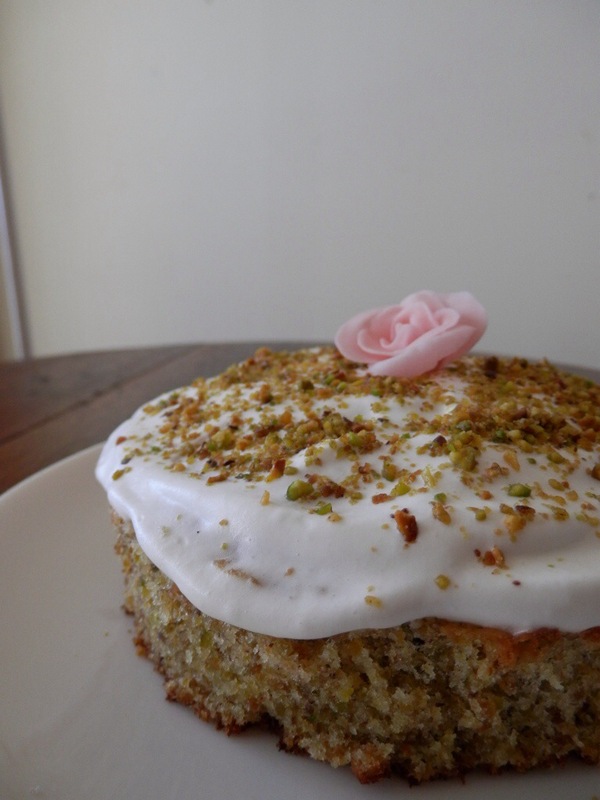 I had a slice of a pistachio and rose cake with the bride over a year ago in a little cafe in Cornwall. She loved it and I said one day I’ll work out how to make it for you. What better day than her wedding day? Well, actually I had a test run which everyone ate before I could get more than two photos! 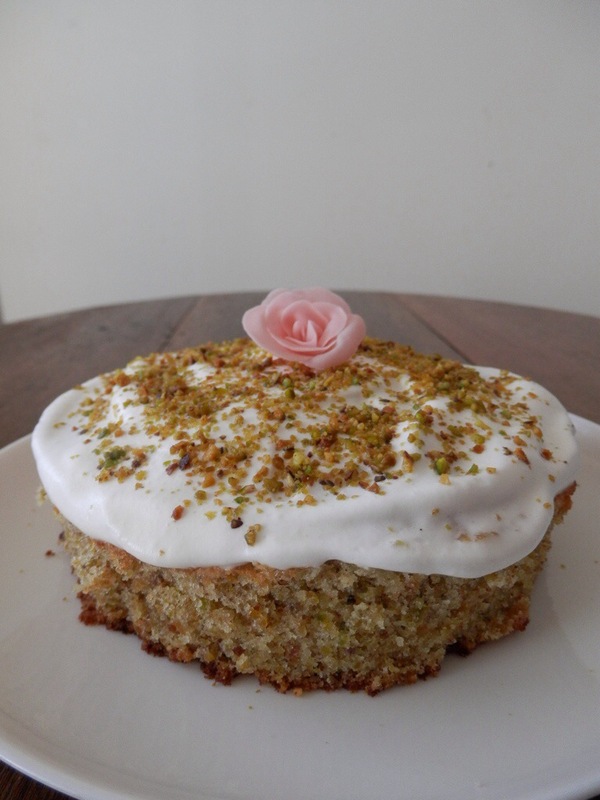 I trawled the internet looking at recipes until I came across this blog, maybe it was the beautiful photos, or the pistachio-sugar ratio, but I just new this was the recipe I was looking for. Its a delicate fragrant sponge with a touch of nuttiness. Delicious. I bought this fancy multiway square tin for the wedding cake and then we decided it should be round. I didn’t want to buy three more tins so I decided to carry on using this one and just cut out the cakes, this cake was a test run for that too. Cardamon is ridiculously expensive in Portugal I decovered. I’m talking 5€ for a little pot! So I left that out. Pistachios are also mentally expensive, and salted. Everywhere! I went to the biggest supermarkets and couldn’t even find shelled ones let alone unsalted. So I shelled each pistachio and washed them in a colander under running water then dried them on a tea towel in the sun, or toss them around in a dry frying pan. When buying pistachios like this, get double the amount, if not more to be sure. I didn’t make any praline for this cake, but for the wedding cake I had some extra pistachios so I whipped up some caramel (sugar and water boiled), poured it over and then cracked it up when hard. I folded that through the cream for the filling with some icing sugar and rose water to taste. It was amazing. There was some left overs of that which I popped in a tupperware and in the freezer as an experiment. It worked! Pistachio and rose icecream! Unfortunately I have no idea what the ratios where, it didn’t freeze solid, no churning or anything. If O ever make it again, I’ll take jote of what I’m doing and post it here. Promise! I modified this recipe using the CakeOmiter app for a 6″ tin, however I have posted the original recipe here. In a food processor, blend the pistachios until very fine. Add flour, ground cardamom, baking powder and pulse to combine. Set aside. In a large bowl, cream butter and sugar until very pale. Add eggs one by one, mixing well after each addition. Add pistachio and flour mixture, milk and rosewater. Use a metal spoon to carefully mix the ingredients together until just combined. Pour into tin and bake for 45 minutes, until golden on top and a skewer comes out clean. Cool cake in tin for 10 minutes before removing to cooling rack. Whip the double cream and fold in the rose water and sugar to taste, pile it on top of the cake.